Willow Pattern Transfer pattern with gold rim. Large Victorian Staffordshire Cup & Saucer. 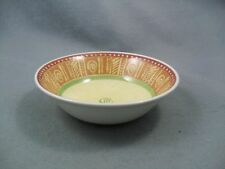 Set of four Churchill Ports of Call cereal bowls 'Kabul'. Excellent condition, only lightly used. New listingVintage Crown Clarence 50s Trio. 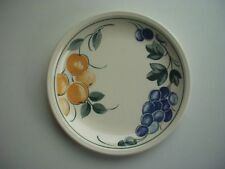 Hand painted plate & Saucer. Seaforms / Shells. A rare 1950's Crown Clarence Tea Trio. 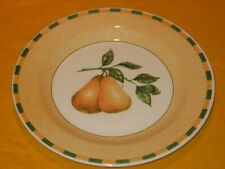 Oval tea plate and saucer hand Painted with stylised shell like shapes, with speckled grey glazes. The Cup has a yellow glaze interior. 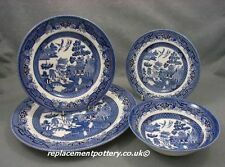 FABULOUS & RARE MIDWINTER POTTERY, 'SAVANNA' TRIAL PATTERN IN BLUE, 7" PLATES. Backstamp: Unmarked trial item; blue glaze paint marks to match front. Marked on base Davenport Longport Staffordshire with crown. The Hospice aims to bring peace, comfort and dignity to patients and families facing the crisis of serious illness. 7.5cm H to top of handle, base 5cm, rim 10.5cm (with handle 13cm). 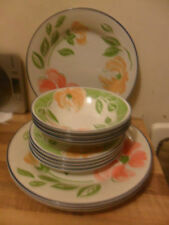 The Dinner plates have no back stamp, the Tea/side plates and cereal/soup bowls have the Victorian English Pottery back stamp. This stunning 4 piece dinner set, has dinnerware which features the forward facing skull on a plain background with a stylised lace edging and was proudly made in the heart of the English Potteries. Ringtons Blue Willow. 2 x Ginger Jars. In very good condition, look unused. It’s minor but just so you are aware. Plate as shown marked empire on the back. 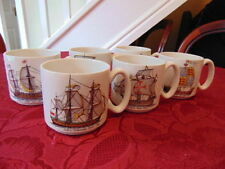 This pair of Churchill Jeff Banks Port of Call Kabul tall coffee cans beakers are in superb as new condition.